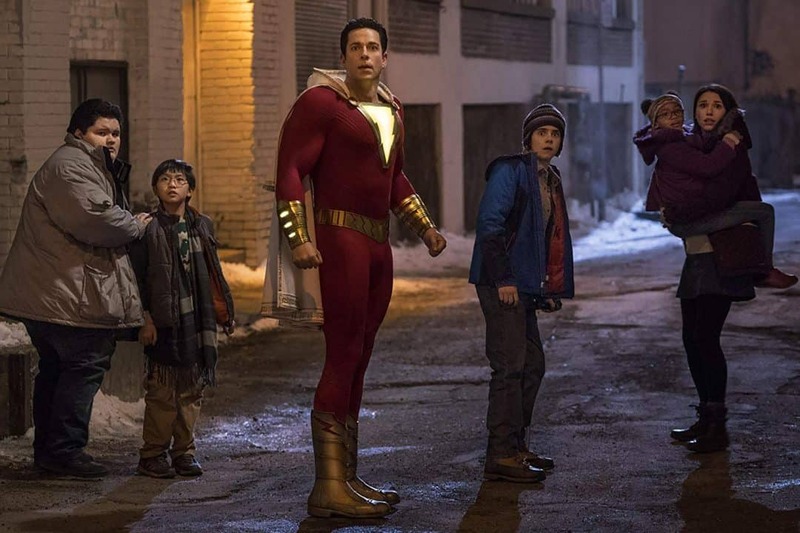 Reviews » Theatrical Reviews » Shazam! Shazam! is a surprising and surprisingly strong addition to the DCEU, a step in the right direction as far as quality is concerned, and a film that did a ton right for a little guy standing in the shadows of bigger, badder, darker superheroes. I was surprised to learn right before I watched the movie that Shazam is the name of the wizard, not the hero, and that the hero's name was once Captain Marvel, before legal battles and copyrights and blah blah blah. So there were two Captain Marvel movies released one right after the other, and in my book the competition wasn't even close, Shazam blew Carol right out of the water with ease. What works here is basically everything, a well-rounded project that's both a simple good time and a complex story arc, revolving and resolving slowly into something we can sink our teeth into and enjoy with relative ease. Billy Batson has been bouncing from foster home to foster home for years, all the while searching for his mother, who he was separated from when he was small, but who he has never forgotten. He's street smart, bitter, lonely, in need of a family, but can't let anyone close; he simply runs away to the next group home whenever things get rough or he finds another clue about his mother. But the time for running is now over; Billy has been chosen for something far greater than his own, personal quest. 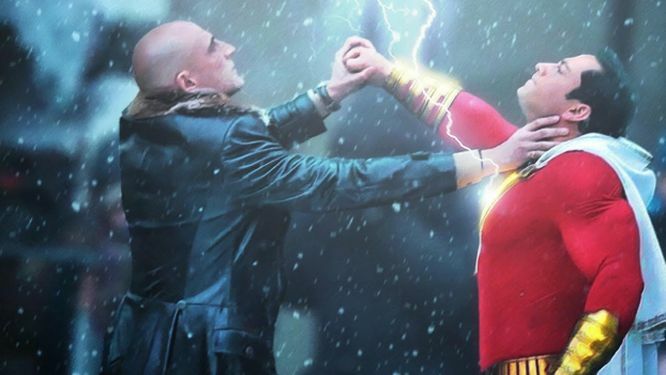 The wizard Shazam has been looking for a Champion, someone to fight for peace, a pure soul, and with time running out, he guesses Billy will do. With a magic word, the kid becomes a man, wielding awesome power, if only he can harness it for good. He had better learn quick, because another Champion has been chosen, this one fighting for evil, and he will stop at nothing to see Batson dead. Billy, Shazam, Captain Marvel, Sparklefingers; whatever you want to call him this superdude is here to stay. The amount that this Captain Marvel movie is better than the other Captain Marvel movie is immeasurable, and I say that knowing that I could be grouped alongside misogynist Fan Boys, which is a group I couldn't be further away from socially, politically, feministally, I'll stop now. But I'm a film critic, card-carrying, and I think it would be simple bad taste to think that Brie Larson's vehicle was in any way better than Zachary Levi's. Shazam! is purely a great, fun, cool, enjoyable, clever, well-orchestrated superhero flick, and that doesn't come around very often, despite how we fawn over the genre. This movie is well-written, well-paced, and well-thought out, a complete story from start to finish, with only minor flaws, not even depending solely on explosions to get by, letting emotions come to the surface in a very refreshing way. Levi is awesome, Grazer steals the show, Asher is fine, and Mark Strong plays the villain perfectly, obviously, cementing a strong cast that I felt really fell naturally each role. It's interesting, I think there was a lot cut from this film that we will never see, at least not other than in the special features of the DVD, or else moved to the post-credit scenes, which are worth the wait. But that might also be what made this film so great; I think it was edited very nicely. In fact, so was the trailer, as it gave almost nothing away, and I can't express how much I appreciate that. Especially the ending, which I will not spoil, and which was completely secret, so credit to the entire crew who worked on producing this movie, advertising it very well, and had a product to back up the talk when it came time to sit down and watch. Not every film can say the same, that they knew how to market but also how to deliver; I really respect what David Sandberg and Henry Gayden did. Especially when you consider the bumps the DCEU has endured, and the roller coaster it rode to get where it is today: Man of Steel, DOJ, Suicide Squad, Wonder Woman, Justice League, Aquaman. 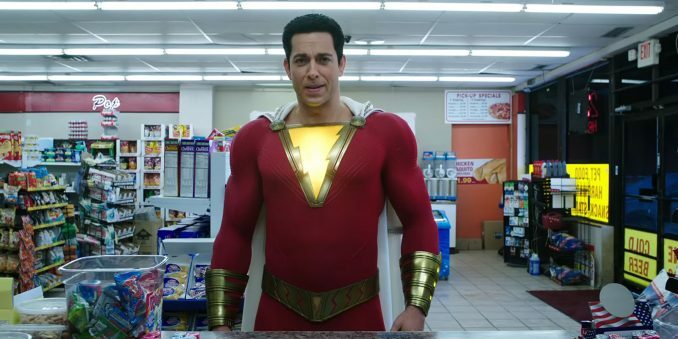 I liked Man of Steel, skip, skip, I really liked Wonder Woman, skip, skip, and now I've highly enjoyed Shazam!, a positive experience all around and a relief if this is what we might continue to get from this point on.